The Kentuckians reached the Licking River on the morning of August 19, near a spring and salt lick known as the Lower Blue Licks. On the other side of the river, a few Indian scouts could be seen. Behind the Indians was a hill around which the river made a loop. Colonel Todd called a council and asked Boone, the most experienced woodsman, for his opinion. Boone, who had been growing increasingly suspicious about the overly obvious trail the Indians had been leaving, advised his fellow officers that the Indians were trying to draw them into an ambush. Major McGary, apparently eager to prove that he was not a coward as Todd's earlier criticism had suggested, urged an immediate attack. He mounted his horse and rode across the ford in the river, shouting, "Them that ain't cowards, follow me." Men began to follow, as did the officers, who hoped to at least make an orderly attack. "We are all slaughtered men," said Boone as he crossed the river. On the other side of the river, most of the men dismounted and formed into a battle line of three or four divisions. They advanced up the hill, Todd and McGary in the center, Trigg on the right, Boone on the left. As Boone had suspected, Caldwell's force was waiting on the other side of the hill, concealed in ravines. As the Kentuckians reached the summit, the Indians opened fire with devastating effect. After only five minutes, the center and right of the Kentucky line gave way; only Boone's men on the left managed to push forward. Todd and Trigg, easy targets on horseback, were quickly shot down. The Kentuckians began to flee wildly back down the hill, fighting hand-to-hand with the Indians who had flanked them. McGary rode up to Boone's company and told him that everyone was retreating and that Boone was now surrounded. Boone gathered his men for a withdrawal. He grabbed a riderless horse and ordered his son, Israel Boone, to mount and make an escape. Israel refused to leave his father, however, and was shot through the neck as Daniel searched for another horse. Boone saw that his son's wound was mortal, mounted the horse, and fled. According to legend, Boone hid his son's body before leaving, but in reality there was no time. Early the next morning, August 19, 1782, a Monday, the Americans arrived at the south bank of the Licking River near the Blue Licks salt springs. The river makes a sharp loop here around a bare, rocky hill on the side opposite the Americans. The Indian army lay hidden in a series of wooded ravines at the crest of the hill. As the Americans assembled on their side of the river a group of warriors appeared in plain view on the hilltop. They were the decoy. Todd and Trigg called another officers' council; about fifteen men were there in all. Included were Boone and McCary. Boone urged caution; he pointed out all the things he had observed. "They intend to fight," he said. McCary grew angry and defiant. "Them that ain't cowards follow me," he shouted leading a general charge across the river directly into the ambush and hand-to-hand battle that followed. The result was disaster for the Kentuckians and resounding victory for the Ohio Indian/British force. Seventy-two Kentuckians were killed in that fight; more than a third of their force. The Indians and British lost only three men and four more were slightly wounded. This defeat marked the lowest point in the Americans' fortunes in the struggle for possession of the West. The Battle of Blue Licks was the last major battle of the war. 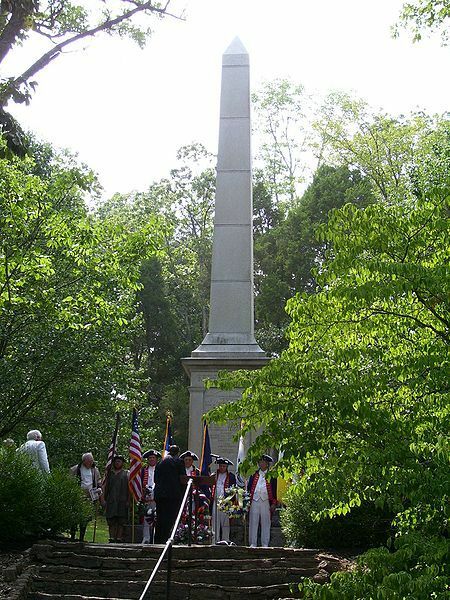 The battle, which took place in the frontier country of northern Kentucky occurred almost 10 months after the surrender of the British commander Gen. Lord Charles Cornwallis, following the Battle of Yorktown. It was a decisive victory for a combined invasion force of 1,000 British regulars and Native Americans from the Ohio nations over a force of 180 Kentucky militia, civilians trained as soldiers but not part of the regular army men. It is considered by historians to be the "low point" for the Americans in the struggle for possession of the western country beyond the Appalachian Mountains, a mountain range in the eastern United States extending from Quebec to the Gulf of Mexico. Prior to the battle, a force of approximately 50 British regulars and Queen's Rangers, under Capt. William Caldwell, together with a force of Iroquois and Mingos, under Chief Joseph Bryant, had moved southward from Detroit to attack the American settlement at Wheeling on the Ohio River. At the same time, a congress of the Ohio nations at the principal Shawnee village of Chalahgawtha along the Little Miami River met on August 2. Simon Girty, one of the organizers of the congress, heard of the British and Iroquois invasion force and sent a messenger to intercept them, with the intention of creating a combined force to move against the Americans. The plan was to forgo attacking the Americans at the fortified position in Wheeling but instead to attack in central Kentucky, where an invasion would not be suspected. The plan was specifically to deceptively attack the small American settlement at Bryants Station with a small decoy force of Native Americans. The Americans at the nearby larger settlement of Lexington would necessarily send out a relief party, the size of which could be judged. The fleeing Native Americans would then lure the Americans into an ambush by the larger British and Native American force, which numbered approximately 1,000 men. The plan was enormously successful. 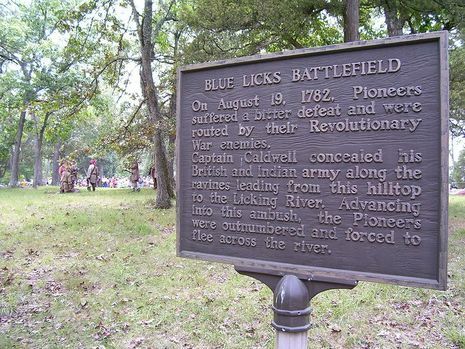 The bulk of the British and Ohio nations force hid at Blue Licks, a salt lick on the Licking River, while a small party attacked Bryants Station, purposely allowing a few to escape to notify the Kentuckians at Lexington. A force of approximately 180 Kentuckians, under a group of various leaders in cooperation set out in relief. Daniel Boone, who led a force of 45 militia from Fayette County, as well as another major contingent from Lincoln County and under the leadership of Stephen Trigg who was assisted by Hugh McGary of Harrodsburg, who had lost his family in an attack by the Indians 5 years before the battle. Boone had grown increasingly suspicious of a trap from the obvious trail left by the fleeing Native Americans. At the officer's council, however, McGary was insulted at the implication of cowardice on his part and impulsively led a charge across the river. The ambush resulted in hand-to-hand combat. The contingent, including Daniel Boone, was ambushed in a ravine, and within a few minutes, the out-numbered Kentuckians were driven in panic back across the Licking River. The Battle of Blue Licks was often called the last battle of the Revolutionary War because the Kentuckians engaged both the British soldiers and Indians.